Dr Christos Gatzidis has co-authored an instructional text book on Epic Games’ Unreal Development Kit (UDK), a free game engine. UDK is one of the most popular third-party developer licensed game engines around (the commercial version of the Unreal engine is used in games such as Batman Arkham City, the Mass Effect series and many others). The Unreal engine can also be used for 3D virtual world/environment creation, including of course interactive touristic experiences. 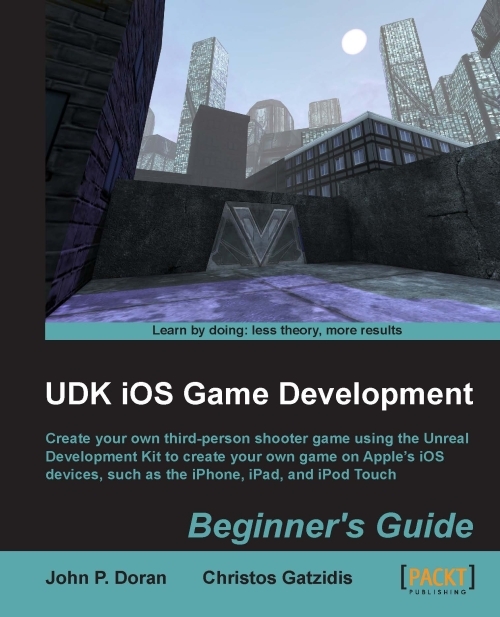 The book, titled UDK iOS Game Development Beginner’s Guide was published by Packt Publishing on the 24th of August. It covers the fundamentals of the Unreal engine via the creation a third-person shooter game in UDK, with a specific focus on Apple mobile device deployment such as the iPad, the iPhone and the iPod Touch. After the game is created, the reader will learn what can be done with any project in order to optimize a UDK game for the iOS platform and discover special considerations that need to be made. Finally, the user will be shown how to publish his/her game on the App Store for the world to see and play along, with details on different costs associated with publishing.